In this episode, the Canticle crew discusses how to take rules from D&D and reskin them to create the type of character you want to play. And did Tim seriously suggest using a bard for a Knight of Solamnia? Hosts: Trampas, John, and Tim. 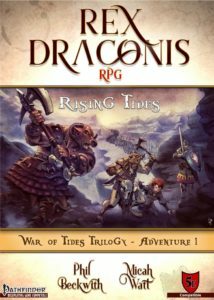 Trampas talks with Phil Beckwith and Micah Watt from PB Publishing, the company producing the Rex Draconis RPG! Rex Draconis is Richard Knaak’s “love letter” to Dragonlance, yet it goes beyond as well. See what the boys down under are doing with the license for Rex Draconis! The Canticle crew discuss the influential characters of the Dragonlance saga. Artist Jeff Easley and Larry Elmore, and authors Tracy Hickman and Margaret Weis talk about the good old days creating Dragonlance at TSR in the Return to Dragonlance panel at GaryCon 2018. Thanks to Dragonlance Canticle roving reporter John Rhyne for recording. For the video version, click here. Dragonlance Canticle #99: SAGA Rules! On this episode the gang explores Dragonlance’s history and the lows (or highs) of it’s conversion to the SAGA system. Cards are better than dice right…? In this episode, the gang talks all things kender. So gear up, check your belt-pouches and swing your hoopak! 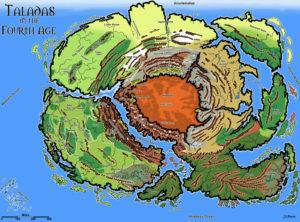 In this episode, the Canticle crew talks about Dragonlance’s second continent – Taladas! Plus discussion of the Taladas trilogy.